Next time you come across a speed-breaker on a road or your vehicle jumps after hitting on it, don’t frown. These speed breakers or humps may generate electricity in future. This idea of using speed- breakers on the roads to generate electricity has been a topic of much experimentation and debate and recently caught the fancy of two students of the Aklia Group of Institutions. Congress-PPP joint candidate for the Bathinda Lok Sabha seat, Manpreet Singh Badal, seems to be more worried about placating all the Congress leaders and workers in the district, than developing a rapport with the voters of the district or taking on Harsimrat Kaur Badal in the elections. The Divisional Railway Users Consultative Committee (DRUCC) has written to the Union Minister for Railways, the Railway Board of India and other senior officials of the Ambala, Ferozepur and Patiala divisions of the Northern Railways for optimum utilisation of the rake of the newly-introduced Bathinda-Jammu Tawi Express (train No. 14501/02). Government Rajindra College today organised its annual prize distribution function to felicitate the students for their performance in various fields during the academic year 2013-14. Vice-Chancellor of the Baba Farid University of Health Sciences, Faridkot, Dr SS Gill was present as the chief guest during the function. 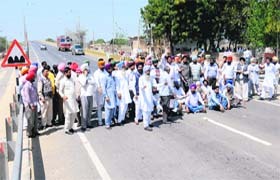 Mansa, which is one of the nine assembly segments that form the Bathinda Lok Sabha constituency, has the maximum number of voters (1,97,151) while Talwandi Sabo has the least (1,43,730). The police today booked a woman and her husband from Gumti Kalan village for duping Jaspal Singh, a resident of Dhelwan Wala village, on the pretext of providing him with work permit in Singapore. The city eagerly wants more libraries and reading rooms to come up where those seeking a peaceful environment for study. The Public Library located near Gole Diggi is not only a place where one can read or study in peace, but also a trendsetter in inculcating reading habits among the students and others who are interested. 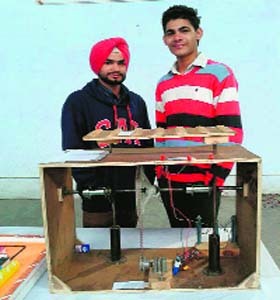 Gurwinder Singh and Sukhraj Singh, students of Class XII (non-medical), recently demonstrated a model of generating electricity using the speed- breakers and the energy produced by the vehicles passing over them. Guided by faculty member Tanu from the electrical trade, the duo demonstrated that instead of using concrete and bitumen to make these speed- breakers, materials like mild steel and cast iron may be used to make these speed-breakers. “As opposite the stationery concrete speed- breakers, these modified speed-breakers will be pressed inside by the vehicles passing over them. When these metal plates will be pushed down by the vehicles, the kinetic energy of the vehicles and the hump will help in rotating a shaft attached to the moving speed-breakers. This shaft will then rotate a dynamo attached to the motor of the generator,” said Gurwinder. He added that although this model had been a topic of experiment for more than a year now, the government should look at it seriously. Since the number of vehicles plying on the roads is increasing with every passing day, the shaft will be rotated almost constantly and will help in generation of electricity. “Initially, electricity will be produced only in small measure but this will be enough to light up the street lamps in the cities or by the roads. World over, experts are looking at alternative sources of energy production so that the pressure may be relieved on the depleting sources of energy,” he added. Sukhdev added that since the number of vehicles is increasing everyday, this model of producing electricity will be a successful and an economical one. “Gradually, the old speed- breakers may be modified to adopt this model. Initial investment will be required to set up this model of electricity production, but that’s the case with putting in place all the alternative sources of energy production,” he said. The PPP president has a tough task at hand — first getting all the Congress leaders and workers of the district together and then getting them to rally behind him to ensure that the public sees the force of both the parties behind him. Seeking to attain the task, he has been holding meetings with Congress leaders. While the District Congress Committee (Rural) has been vocal in its support for Manpreet, the District Congress Committee (Urban), already caught in groupism, is a cause of worry for the leader. After playing Holi with the DCC (Urban), president Sohan Lal Jhumba and general secretary of the Punjab Pradesh Congress Committee Harminder Singh Jassi, Manpreet held a meeting at the residence of PPCC executive member Narinder Singh Bhularia late on Tuesday evening. 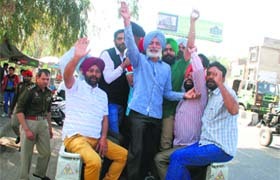 Blaming the SAD-BJP government for the bad economic health of the state and for introducing anti-people policies, he expressed his disbelief over the courage with which the Badal family is asking the people of the state to vote for them again. He also held the government responsible for the lack of law and order in the state, the deteriorating state of industrial sector and rising unemployment and also alleged that the state government was never serious about implementing or sustaining the pro-people schemes and policies launched by the Central government. He also took the opportunity to shower praises on the Congress-led UPA government for introducing pro-people policies and schemes. Also present during this meeting were PPP district president Sukhdev Singh Chahal, chairman Hardev Singh, Harwinder Ladi, Devinder Dippy, Karandeep Singh Bahia, Harinder Mann, Nahar Singh Bhucho and other leaders. Taking cognizance of the fact that the Bathinda-Jammu Tawi Express is a weekly train and remains idle at the Bathinda junction for five days, the DRUCC has argued that the rake may be used to run tri-weekly on the Bathinda-Jammu Tawai route or may be utilised to ply passengers between Bathinda and Chandigarh or Bathinda and Saharanpur. The Bathinda-Jammu Tawi Express leaves Bathinda junction at 21:05 hours on Thursday and reaches Jammu at 07:15 hours on Friday. The train leaves Jammu at 23:25 hours on Friday and reaches Bathinda at 10:20 hours on Saturday. From Saturday to Thursday, the train remains idle at the junction for five days. 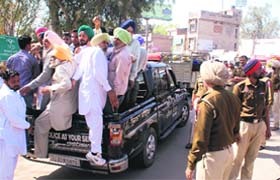 He added that the demand for a morning train from Bathinda to Chandigarh is high. “The only train which can be used by the residents of Bathinda and adjoining areas is the Barmer-Kalka Express which leaves the Bathinda junction at 23:50 hours. 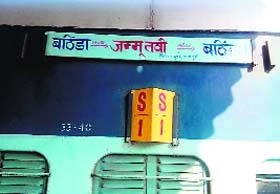 The only train which can be used to go to Sahranpur is the Sri Ganganagar-Rishikesh Express (train No. 14711/12) which leaves Bathinda junction at 06:30 hours and arrives at the junction the same night at 23:45 hours,” Singh said. He added that the idle rake of the newly introduced Bathinda-Jammu Tawi Express may be used either to introduce a morning train to Chandigarh or to Sahranpur as the demand for these trains is high in Bathinda, Tapa Mandi, Barnala, Rampura Phul and other areas. Dr Nirmal Singh Jaura, Director, Youth Services, Panjab University, Chandigarh, was present as the special guest. The programme began with a shabad gayan. College Principal Vijay Kumar Goyal, Vice-Principal Prof Ramesh Chandra Pasrija, Prof Jyotsna Singla, Prof Gurjit Mann and Prof Manvinder Singh welcomed the guests. The annual report, prepared under the supervision of Prof Arun Bala, was also present. While five students were awarded with the Roll of Honour for their academic performance, one student was honoured for bringing laurels in sports, three for excellence in cultural field, two for NSS and two for the NCC. The students who were given the College Colour included one for academic excellence, nine for cultural activities, six for sports and one for the NSS. Among those who got merit certificates were 48 students for academics, five for cultural activities and eight for contributing to the college magazine. As many as 61 students were also honoured for attaining first, second and third positions in examinations. 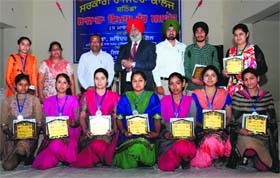 Vice-Principal Ramesh Chander Pasrija (Sanskrit), Prof Usha Kiran (Hindi), Prof Gurjit Singh Mann (philosophy), Makhan Singh (physics), Raj Kumar (commerce), Manoneet Kaur (music) and Harjinder Singh (mathematics) were also honoured for completing PhD while working in the college. While addressing the students, Dr Gill stated that for progressing in life, good health is of utmost importance. He exhorted the students to think positively and face the challenges with all their might. He also urged the students to be confident of their abilities and work towards strengthening them. In his address, Dr Jaura expressed concern over the decreasing number of boys among those winning prizes during the annual prize distribution functions. He blamed the consumption of habit-forming substances behind the decline in the performance of boys in various fields. The stage was managed by Prof Manvir Singh and Prof Gursharan Mann. Prof Jyotsna Singla proposed a vote of thanks. Of the total 15,02,953 voters, 6,451 are service voters while the remaining are general voters. The number of women voters is 6,98,312 as against 7,98,190 men voters. From amongst service voters, 5,179 are men and 1,272 women. At least 1,570 polling stations have been set up at 869 locations. Each location has the maximum four polling stations in rural areas and five in urban areas. “Though minimum number of stations at each location is two in rural areas and three in urban areas, the same could be increased as per requirement,” said a poll official. 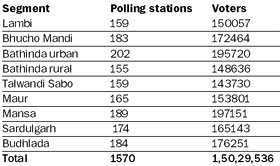 Bathinda urban has the highest number of polling stations (202) while the Bathinda rural has the least (155). 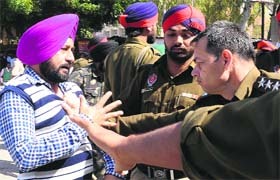 In a complaint to the police, Jaspal Singh stated that he had gone to Singapore last year for which he paid a woman, Harpinder Kaur and her husband Surjit Singh, Rs 5 lakh. On November 20, 2013, he reached Singapore where he worked as a domestic help at Harpinder’s home for a few months. “However, Harpinder came back to India assuring Jaspal that she will arrange work permit for him,” said the investigating officer in case, Satnam Singh. When Jaspal was left alone in Singapore, he called up his family asking them to arrange for ticket for him to come back to India. On returning to India, he asked Harpinder to return his Rs 5 lakh but she refused. The police have booked Harpinder and her husband Surjit Singh. The police today recovered four kg of poppy husk from near Pucca Kalan village and booked woman Binder Kaur, a resident of Pucca Kalan village who managed to escape from the spot. Students from the old parts of the city, where houses are located too close to each other to keep the noise out, frequent the library to study. With just one library and two-three reading rooms, the city is ill-equipped to meet the intellectual needs of its people. With the promotion of reading and writing not being among the primary duties of the Municipal Corporation Bathinda (MCB), which is pre-occupied with providing basic civic amenities to the people, there is no dedicated budget to run the libraries. Two organisations in the city, Balraj Sahni Yaadgari Prakashan and Baba Farid Group of Institutes (BFGI), have taken a lead in this direction by introducing mobile libraries or libraries-on-wheels that go from village to village spreading knowledge. While Balraj Sahni Yaadgari Prakashan (BSYP) publishes and sells books by itself, the BFGI sells books on a no profit, no loss basis. The BSYP has been working since 2002 and the BFGI started its mobile library four years ago. Both the libraries boast of a good sale of Punjabi literature, especially children's literature. Similarly, noted educationist Labh Singh Sandhu is in charge of Lakhi Jungle Punjabi Sath, a publishing house that has been distributing books free of cost to the government and other schools since 2009. Despite numerous efforts being made to keep the reading habit alive among the people, especially the youngsters, the need of the hour is to have consolidated places like reading rooms and libraries where people can walk in amidst books and delve deep into the literary world. 1. The need for dedicated libraries is felt not only at the community level but even otherwise. There is an urgent need to tighten the noose around the libraries being run in the schools where children spend their early years. We have been distributing books free to the government and other schools since 2009. Sadly enough, the government schools have books and libraries, but there is no dedicated librarian. The charge of the librarian is given additionally to just any teacher in the school. On top of it all, there is no library period. In the absence of all these, the books are gathering dust, while children kill their time learning things they should not even know. The government should step in to fill these gaping holes. 2. It was the peaceful atmosphere at Public Library that brought me here. Now, I spend at least 6 to 8 hours in the library studying for my chartered accountancy course. It gives me more space to concentrate, something that I miss amidst the hullabaloo of my home. While we males can still come from our homes to study at libraries located far off, it becomes difficult for the females to do so. The government should open reading rooms at least ward-wise so that students can visit and take advantage from it. At the same time, the number of libraries on a small- scale should be increased in the city. 3. Working with my mobile library since 2002, I have covered over 2,125 schools and colleges, to instill reading habit among the children. The efforts have started showing results and today, we have a larger crowd of children assembling outside our van than it used to be a couple of years ago. However, the mobile libraries do not have the facility to sit and read in. It is the libraries with these facilities that instill the passion to sit and study for hours together. In the absence of such structures and inspiring literature, our children are lost in the culture of video games, computer games and mobile phones. 4. We are running our mobile library on a no profit, no loss basis for the last four years. We also get special calls to get our library stationed at places where sports tournaments or literary functions are held. The reading habit is still alive in our children. The need of the hour is to make good literature accessible to them. We need more places dedicated to general reading and writing than more educational institutes. 5. I have been visiting the library to study for the past three years. Here, we have the facility of separate rooms to study where newspaper readers or other casual readers do not sit with us. I spend more than six hours here and go home only for meals. It is because of the books and the peaceful atmosphere that I feel charged enough to study. My home is located in a densely populated area which does not have enough tranquillity to let one study. We wish more such well-managed libraries come up in the city, especially in the area beyond the railway lines so that no youngster is bereft of the power of words. 6. At our Lala Sant Ram Memorial Library, we have just a handful of books and an equally less number of newspapers. We want the government to fulfill its promise of giving us books worth Rs 25,000 that it has made to us twice. We have also requested the municipal corporation to ensure that we get all the newspapers that we have been promised.